I wish I would have taken a photo of yesterday’s lunch because it was pretty darn good. I combined pulled chicken (I made a big batch on Sunday), green grapes which I halved, a small handful of whole almonds, and leftover pieces of dried cherries and dried mango. I added yellow mustard and gave it all a good stir. The combination of salty and sweet was just perfect. You know what made it even better? Eating it at lunch break while visiting with my mom! It was such a nice treat. She was off of work yesterday so we met over by my work and we both ate our lunches together and chatted away. I loved it so much! After work I headed to the gym although I was really not in the mood to go. I got the self talk rolling though and told myself, just go, you never regret a workout, and that is just what I did. Strength training was on the agenda today. I warmed up with ten minutes on the stairmaster, then hit the weights which were super loaded with men which is fairly intimidating to me. I try to work confidently but can’t help but be slightly self-conscious. Here’s the rundown of my workout. Not too shabby considering I wasn’t the most motivated to workout. For dinner I pulled together a household favorite, which is veggie-packed (surprise, surprise). Although I made my best effort to eat healthy this past weekend in New York, I still got a little “off” speaking in terms of digestive health. It won’t take long to get back on track, though. Especially with a dinner like this. Drumroll………for veggie hash. You guys, if you have not tried this dish yet, you must. Take whatever vegetables you happen to have on hand and saute in a little olive oil. Add flavor with your favorite seasonings and/or herbs, top with an over-easy egg aka “runny egg,” cheese, nutritional yeast, and add fresh chopped tomato at the end. The rest of the night was spent wasting my time watching The Bachelor, searching for a green food to bring to my St. Patty’s Day inspired work meeting, doing some laundry, and snacking on some Fiber One 80 honey squares. Now, I am off to find motivation to tackle a run. Perhaps I should refer to the beginning of this post where I mentioned motivational self-talk from my workout yesterday? I’m just being a baby because it’s just a little more chilly outside this morning than I thought it would be. It is supposed to be in the 60’s today though and 70’s the rest of the week! Woop woop! I WILL be going for a run. How about you? Have you moved something today? Let me see you move somethin’! I really love this guy in these Blue Cross Blue Shield commercials. He makes me giggle everytime and kind of reminds me of my dad for some reason. DO GROOVE! 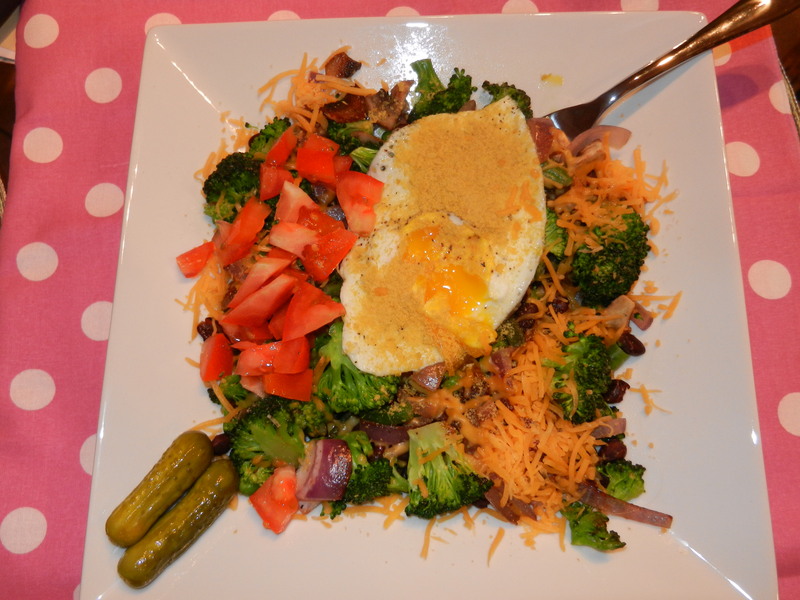 This entry was posted in Dinners, Recipes and tagged Strength train, Veggies by Melanie. Bookmark the permalink.